I conducted anonymous surveys of my teaching and curriculum at Wuhan University of Technology. I was very happy with the results, knowing there is always room for improvement. I conducted surveys after most classes. These were simple surveys to help me better understand how the class was progressing. I remember last time I taught in China, only after the fact did I find out some very profound issues that hindered better learning. Concerns that could have been easily remedied if I had known during class. 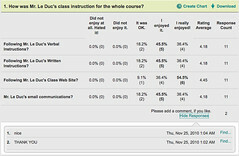 So, now I self-assess with quick formative assessment techniques, including online surveys. I felt much better connected with the student sentiment and understanding throughout this class. Of course, the students were wonderful and very cooperative and supportive of each other! That made a huge impact!